A human rights organization said Monday it planned to stage the world’s second-ever virtual political rally in central Seoul this month to denounce a series of police bans on demonstrations near the presidential office. 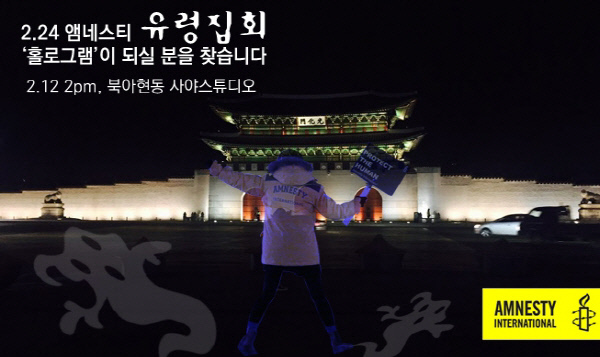 The Korean office of Amnesty International will hold a hologram rally, which it has called a “ghost rally,” in Gwanghwamun Square on Feb. 24, a day before the third anniversary of President Park Geun-hye’s inauguration in 2013. The hologram rally does not feature real-life demonstrators, but uses a projector to show ghost-like figures marching, chanting and holding placards in a hologram video. The participants were asked in advance to send in their own photos, text messages and recordings of slogans in their own voices through messaging app KakaoTalk, which will be synchronized with the holograms on the big screen. The nation’s first hologram rally comes after police refused to grant a permit for the Korean office of Amnesty International to stage a rally calling for greater freedom of speech on Feb. 24 in front of the Cheongwoon Community Center near the presidential office. A promotional poster issued by the Korean office of Amnesty International to encourage Koreans to participate in an upcoming hologram rally to be held on Feb. 24 at Gwanghwamun Square in central Seoul. The human rights group, instead, received a permit to use Gwanghwamun Square from the Seoul Metropolitan Government. A police official told The Korea Herald that the rejection was a result of serious concerns over traffic disruption. Cheong Wa Dae was not at all a factor in prohibiting the Amnesty-led rally, the official said. ”Around Cheong Wa Dae is a residential area. We rejected the applications for the rallies expected to disturb the neighborhood and the traffic, not because they were planned near Cheong Wa Dae." Police data shows that authorities have banned most of the planned rallies or attempted marches near Cheong Wa Dae, citing possible disturbance to the neighborhood and traffic disruption as major reasons. 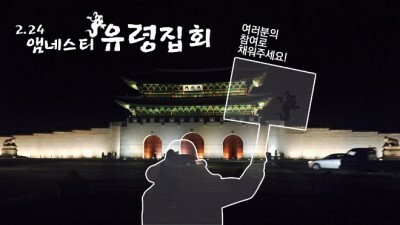 According to data obtained by Rep. Jin Sun-mi of the main opposition The Minjoo Party of Korea from the National Police Agency, 98 percent of the rallies prohibited from taking place in Seoul from January to July in 2014 were proposed to be held near Cheong Wa Dae -- in an area loosely stretching from Gyeongbokgung Palace through Gwanghwamun Square and across from Anguk Station. South Korea has faced mounting concerns over freedom of expression, with human rights activists blaming the Park administration for abusing its authority to forbid and clamp down on antigovernment demonstrations. In South Korea, rally organizers should apply for a permit to the police 48 hours prior to the rally in accordance with the Assembly and Demonstration Act. All assemblies are supposed to be allowed upon declaration unless they pose a serious threat to public security, disrupt traffic or disturb residents’ private lives. According to the National Police Agency, 281 assemblies and demonstrations were not allowed to be held in 2014. The United Nations Special Rapporteur Maina Kiai on the rights of freedom of peaceful assembly and of association ALSO criticized restrictions on freedom of speech during his recent visit to Korea on Jan. 21-29. The world’s first political protest by hologram took place in Madrid, Spain last April against the newly enforced “gag law." The law allows protests only with a government-issued permit and imposes penalties on protests held in front of public places, including the congressional building.